Moving to a new home or office can be a great experience – just contact our movers in Roselle, IL! Roselle Residents, Call Best Movers in Chicago Suburbs! Many people try to find long distance moving companies Chicago, but you are trying to find the local movers Chicago. Does it seem like a tough task? You need the Chicago local moving companies that operate in the suburbs as well. If you have ever seen our trucks in Roselle, it means you’ve spotted the best team of movers in the 60172 area – Chicago Movers Near me – STI Moving & Storage. We have and can do all it takes to make your relocation into a carefree and quick job. Call us and our kind operators will answer all the questions you have about the local relocation process! When you hire a professional moving company, you want the workers to be skilled, certified and easy to communicate with. So, what makes our Chicago movers the ones you need, you might ask? Professional experience – We established our company more than a decade ago and been keeping our services top notch ever since. We have the best team, supplies, and resources to make anyone’s move go smoothly and fast. Insured goods – At Chicago Movers Near me – STI Moving & Storage, we are aware that we are working with your valuables every day. For that reason, the insurance coverage is essential. There is no need to worry about potential losses or damage if you hire us. In some individual cases, if you are transporting some fragile items, you might need special insurance coverage. In that case, contact us and we will help you arrange everything. ‘Cheap movers Chicago’ can be the ‘best movers Chicago’ – if you think low prices mean low quality, then you haven’t hired us yet. We offer the best services at meager prices, and our cost estimate is free. Our employees can perform an on-site assessement so you can get a great insight into the price for the required service. Friendly and trustworthy team – from our Customer Service operators to our skilled team of movers, at Chicago Movers Near me – STI can offer only the best. We all work in your favor to make your relocation go smoothly so you can finish off your day with a glass of wine that Roselle is famous for. Business Relocation – Peace Of Cake! When you are relocating your business, you want the transition period to go as fast and safely as possible. Since each company or business is special in its own way, our approach to the move is the same. We are aware of the responsibility you give us and we have the resources to perform such a step without any mistakes. Local relocation of your office will be done fast and by professionals! Let Us Help You Pack And Unpack! Our best movers in Chicago suburbs do it all – from transporting the heaviest items to packing the tiniest ones. If you are one of those who would love to leave the packing part of the job to the professionals, we’ve got you covered. 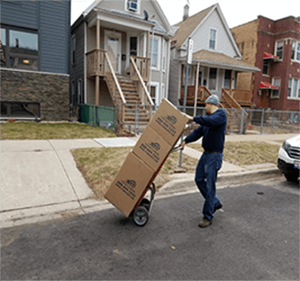 At Chicago Movers Near me – STI Moving & Storage, we have all the packing supplies one can need, and we can pack and unpack everything to your desires. Our crew is easy to cooperate with and very kind. Your moving process will be an ultimately comfortable experience with our best local movers Chicago! Our whole team of Chicago movers will help you relocate in Roselle and make your moving experience the best. Whether this is your first time to move to a new home or you haven’t moved in a long time – this time, with us, it will be anything but stressful. „ I found the best movers in Chicago and Roselle!“ Yes, you did. We always do our best to make our customers happy. Join our family of satisfied clients and call now!